Oooh - what an ADORABLE blast from the past!!! 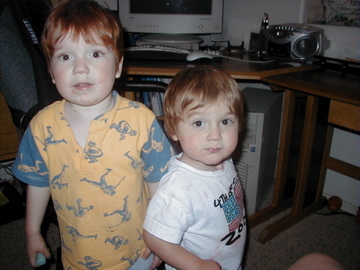 Nate had red hair? I do not remember that. I always remember his hair being dark. Kraig, He was always dark. I think the light / photo made his hair look lighter/reddish in this shot. He had some red highlights, but never anything like Colin. Oh, my goodness. Those tiny little boys! Almost hard to believe. I haven't seen them in almost 4 years and am so looking forward to getting reacquainted. Small Steps & a Chance to Win Free Groceries!